Often people talk about drone in military or playful sector or cinematographic one but have you ever thought other potential purposes of this technology? Government of Rwanda already has done it, it’s the first state to use drones to make good saving thousand human lives. Since October 2016 by according a partnership with Zipline, an automated logistic company based in Florida, it’s possible to delivery blood in a very short time to 21 transfusion clinics in the western half of the country. System is very simple, Zipline’s control center receives the order from health workers by calling or texting so that the team can package items and prepare it on drone for flight. After the medical products are delivered with a parachute, the little airplane return home only landing at Zipline’s distribution center for a quick pit stop before taking off again. Zipline’s service is on day and night, rain or shine and has a service radius of 75 km (150 km round trip), carring up to 1,5 kg per flight, with 500 daily deliveries! In this way blood availability is guaranteed in only 30 minutes, overcoming challenging terrain and gaps in infrastructure, completely reducing waste and stock-outs too. 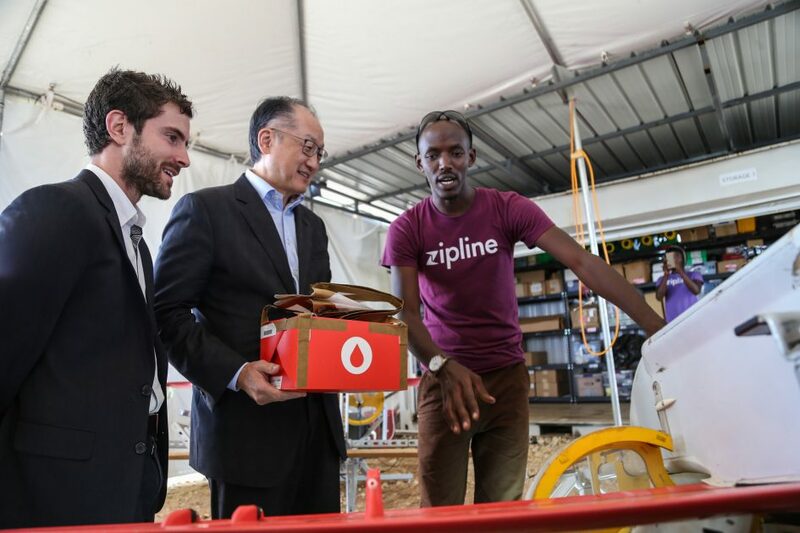 Last march the World Bank president, Jim Yong Kim, visited Rwanda and toured the drones facility in Muhanga district taking part to live demonstration of blood supplies delivery by Zipline team. To Jim Yong Kim these aircraft are one of best positive impact that technology can have and this model should be expanded to deliver other medical products beyond blood supplies such as vaccines and urgently required medicines. So it’ll be soon! After success achieved in Rwanda, Zipline has announced a partnership with Tanzania to create in first quarter 2018 the world’s largest drone delivery, so that to ensure critical and life-saving medicines on-demand. This is a very good example how public and private sector could collaborate together following win win logic, making entire communities’ lives conditions better!